Undertaking Complex Implant Reconstruction is a major lifestyle decision. You need to have complete confidence that your implant team has the necessary skills, training and experience to deliver long lasting aesthetic, functional and healthy results. Dr Dillon has over 20 years experience in the field of complex implant reconstruction and his team has collectively over 50 years of hands-on experience. If poor bridge design prevents easy access for cleaning, you may develop bad breath or worse - gum disease and bone loss around your implants. Parts of your bridge may wear and could require replacement over time. 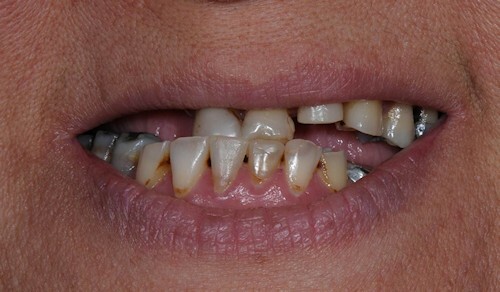 You must be certain that the design of your bridge allows for its professional removal and replacement, with minimal time-out and that the Implant System used has readily available replacement parts if needed. Many implant systems are here today and gone tomorrow or may be only available overseas. If your dentist cannot tick all the above boxes do not proceed! when as a full removable denture wearer, you want better function, aesthetics and the confidence to eat and speak without discomfort or movement of your plate. Four to six implants are required. For fixed implant bridgework, the implants may be joined in a single horseshoe shape or be segmented into individual bridges. The bridge framework may be constructed from titanium, gold or cobalt/chrome and the teeth from either high impact acrylic or porcelain. Minor grafting using a bone substitute (Bio-Oss) may be necessary in conjunction with implant placement. The number of implants placed, grafting requirements and building materials choosen for the bridge is determined according to individual needs and wants and will determine the cost of the procedure. 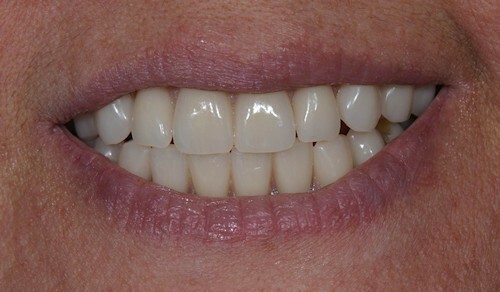 Removable dentures may also be retained by implants to obtain unmatched retention and stability. For removable dentures retained by implants, a minimum of 2 implants is required in the lower jaw (using stud attachments) and four to six implants in the upper jaw. In the upper jaw the implants are joined by a CADCAM milled titanium bar and the denture is then attached to the bar with built-in clips). Removable dentures have the advantage of ease of cleaning and maintenance of lip and cheek support when the remaining ridge is very resorbed. Kay has had her remaining broken down teeth removed and replaced with upper and lower full jaw implant bridgework to restore her smile, her ability to chew and her health.